In last Wednesday's Travel Post, I talked all about my family's visit to Bayfield, Wisconsin. 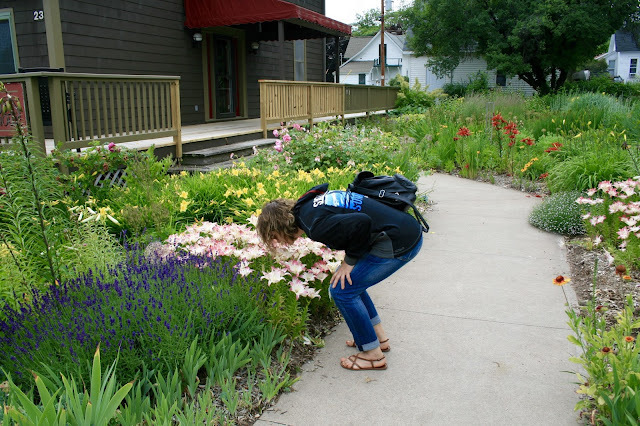 It is the cutest little historic town on Lake Superior, but other than the gorgeous lake views and all the quaint historic buildings, what struck me the most was all the beautiful flower gardens. 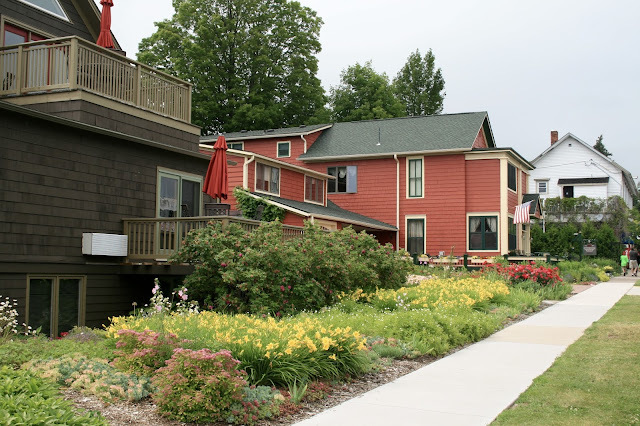 Almost all the businesses and homes had gorgeous flowers; it made me wonder if it was a requirement to live here! 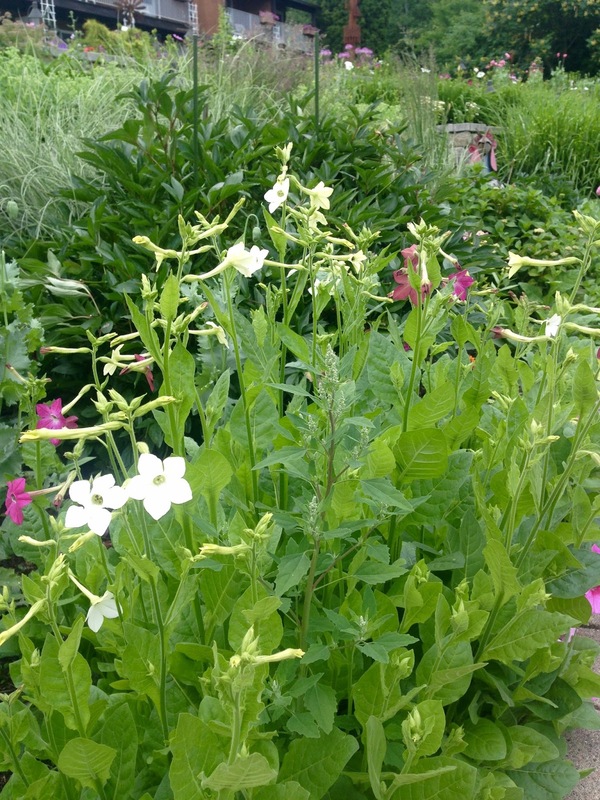 Whatever the reason, I knew I had to take lots of pictures to show these gorgeous flowers to you. First up, these window boxes in front of a downtown business. 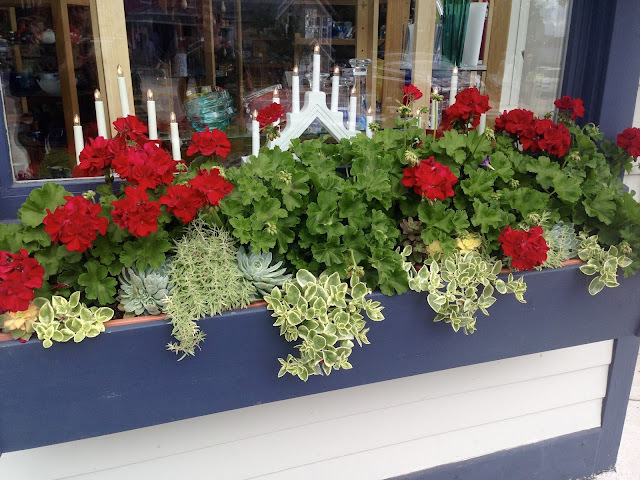 LOVE, LOVE, LOVE the red geraniums against the blue paint! And oh, the contrast of the variety of sedums and creeping vines is gorgeous! 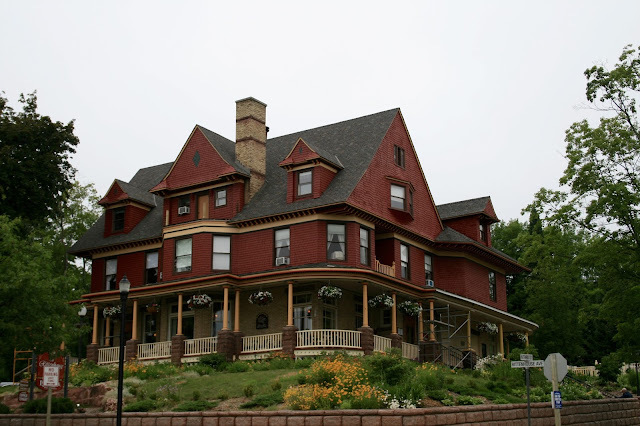 Next is a hotel called Winfield Inn and Gardens. 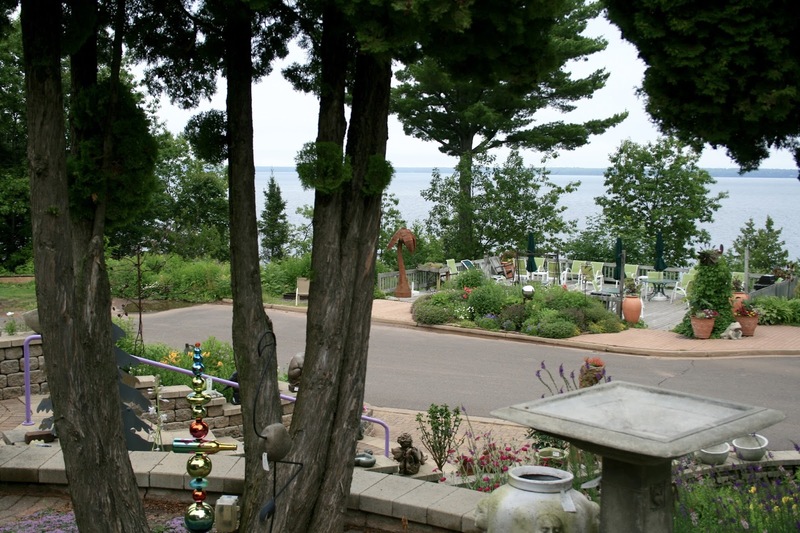 They have a beautiful terraced garden on their property that is open to the public. 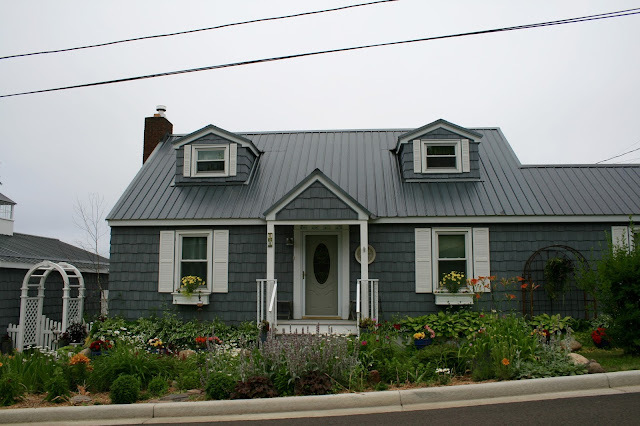 This is the first time I've ever seen window boxes on the roof where the gutters are suppose to be. How fun! It was the middle of July when we visited this garden. 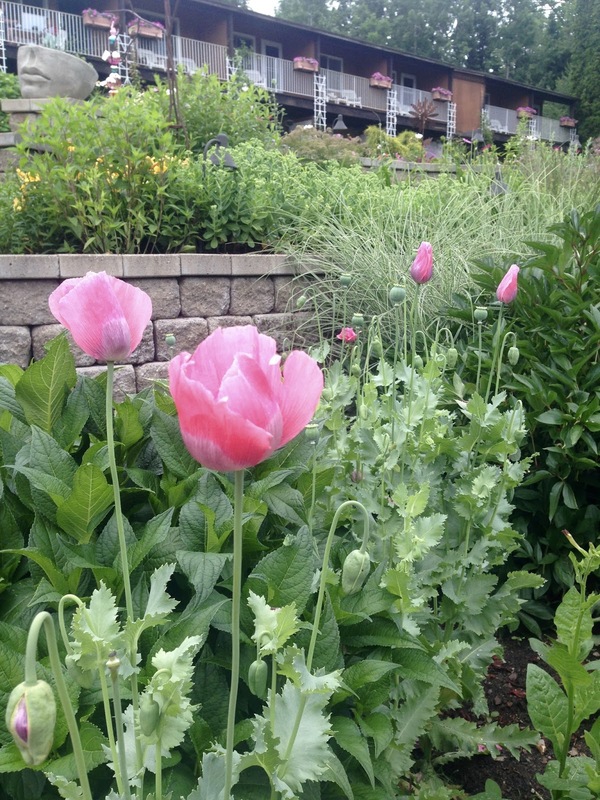 I was surprised to see that they had poppies in bloom this late as they are usually a spring flower. It's a bit colder up in Bayfield then where I live, so maybe plants take a bit longer to get going. I also love this pink variety. I don't see pink poppies too often; orange or red are the usual colors. 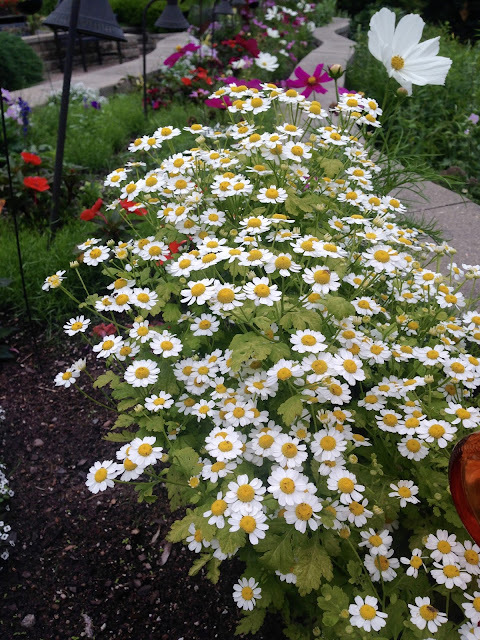 Last year I planted some Nicotiania in my yard and it grew beautifully. The hummingbirds seem to love this plant as well. I will have to try it again next year. Isn't this Marguerite Daisy just gorgeous? What a perfect border plant! 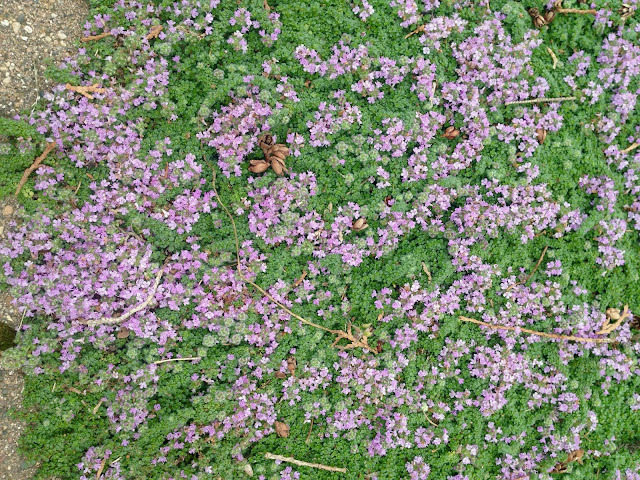 And here is some low-growing creeping thyme. 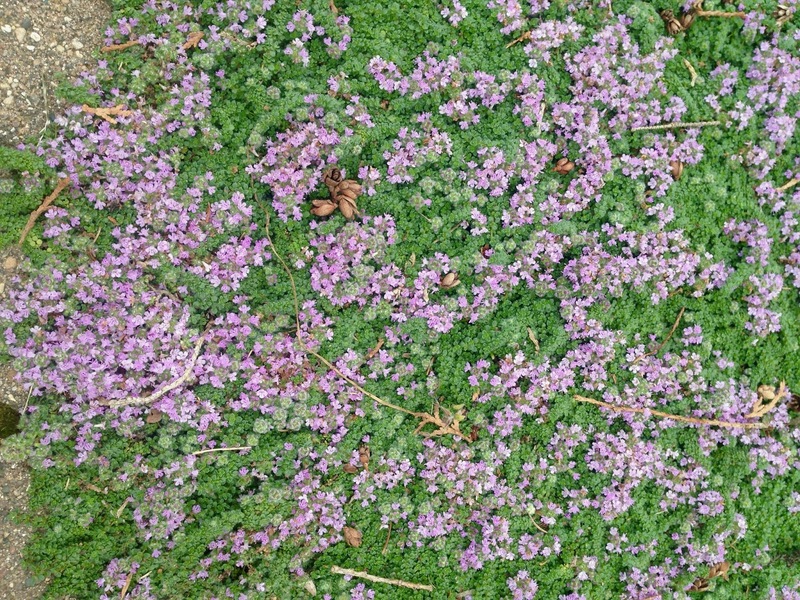 I just love the texture of this ground cover. 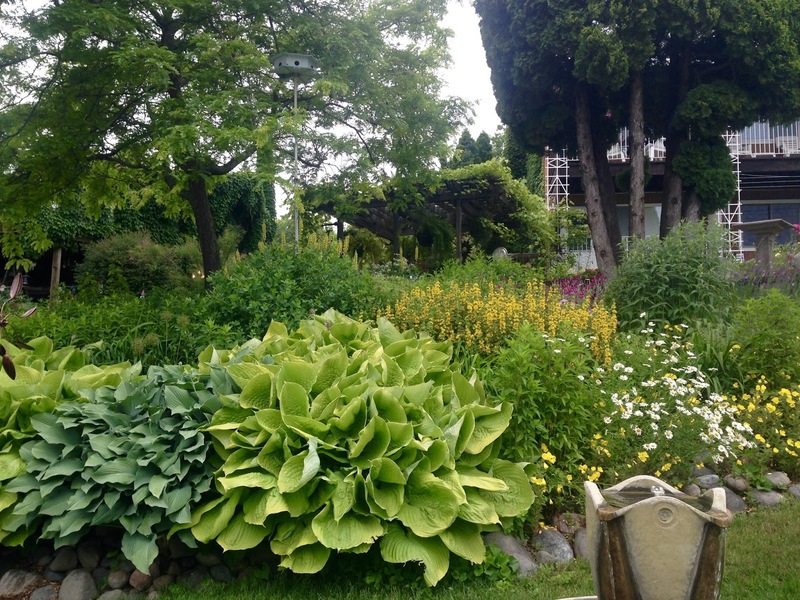 This garden really did it right by playing with colorful and texture so that there was always color in the garden even if nothing is in bloom. 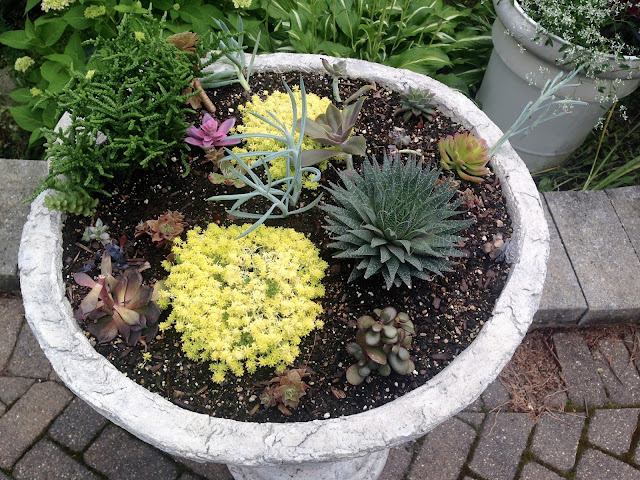 I loved the little miniature sedums in this concrete birdbath. 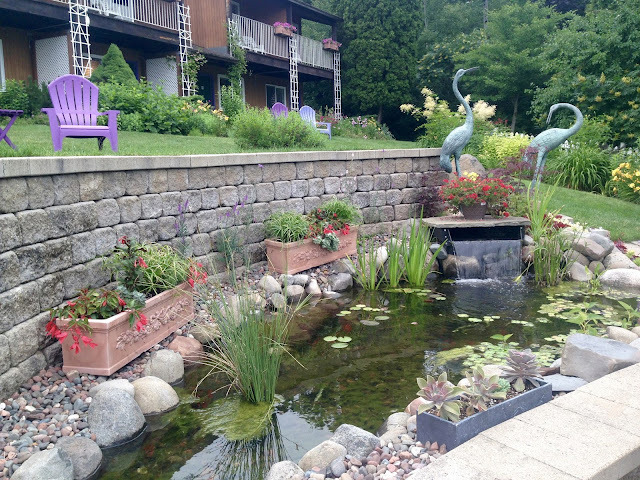 They had one small water feature near the guest rooms filled with water plants and garden states. I love how they put window boxes on all the guest balconies! Such a great idea. I also enjoyed the colorful Adirondack chairs! 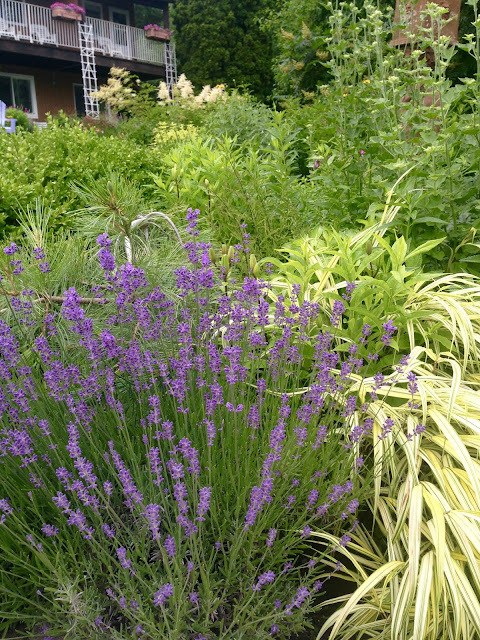 The gorgeous lavender blooms looks striking against the yellow green foliage behind it. 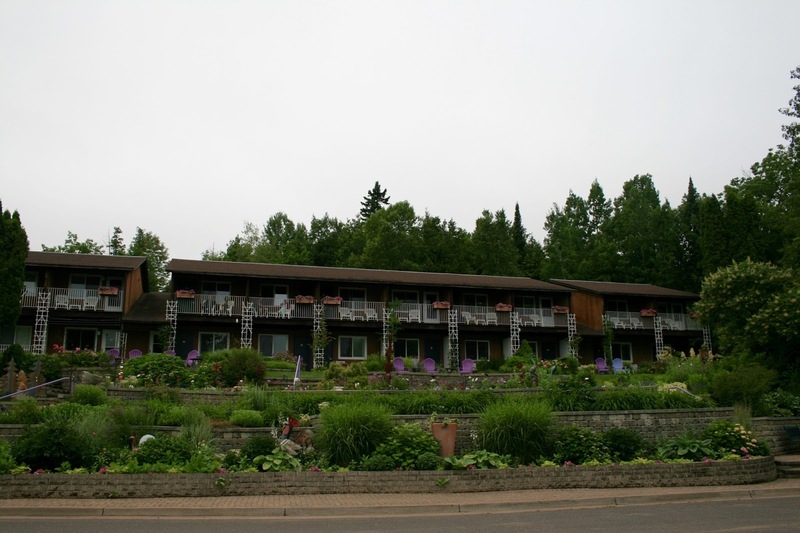 This is a far away shot of one side of the hotel and terraced gardens as viewed from across the street. 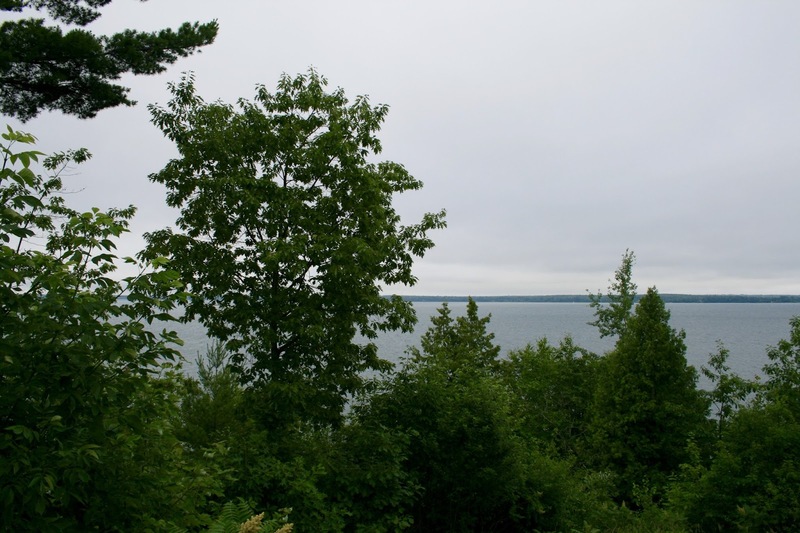 They have a view of Lake Superior. Many of the pots and garden ornaments are for sale. I loved this garden border. 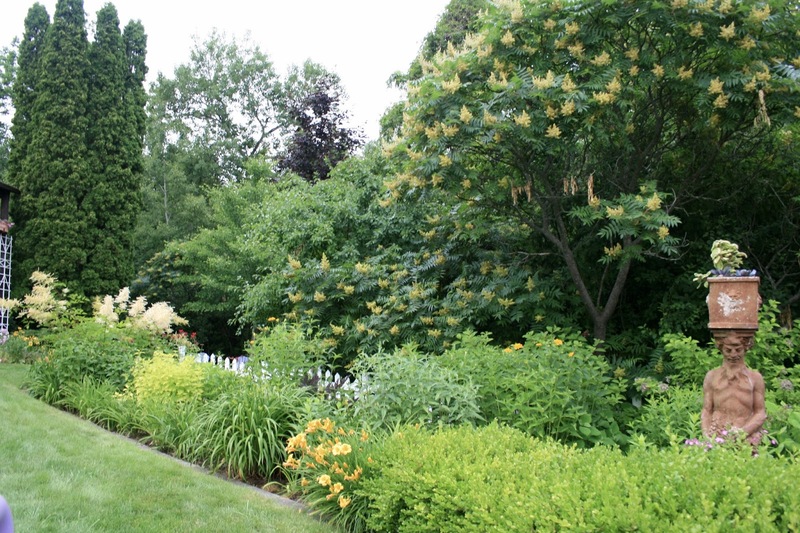 Almost nothing is in bloom but the tree and some Goatsbeard, yet all the different foliage types, textures, and forms provide so much interest. And finally, back in town, here are a few private home gardens that sparked my interest. 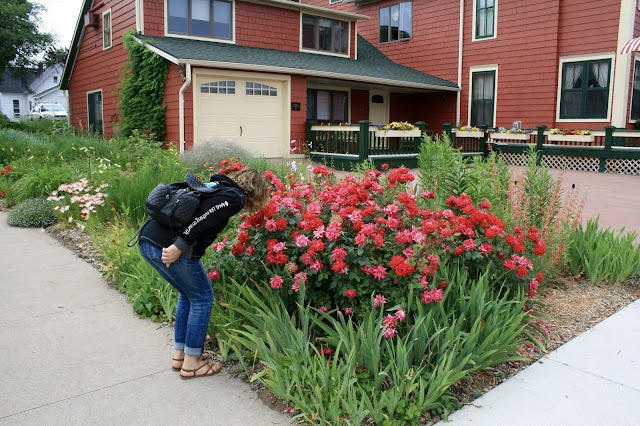 Of course, I had to stop and smell every single flower. This is a bed and breakfast I mentioned in Wednesday's Travel Post. I love all the big, beautiful hanging baskets and the flowers in the retaining wall. But this little house in garden was my favorite at all. 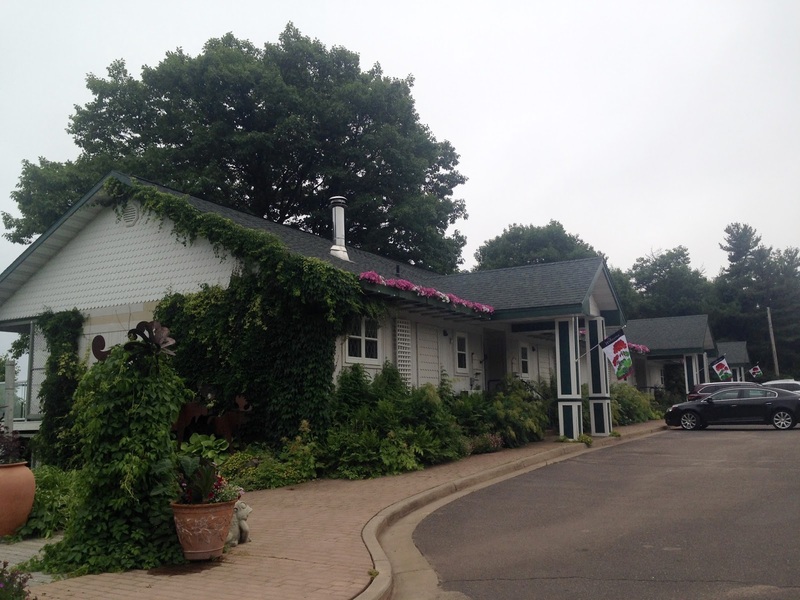 I said to my husband, of all the houses in the town of Bayfield I could choose to live in, this would be the one. Small, cute, low maintenance. This would be a nice house to retire in someday! What a fun idea to put flower boxes into the gutters! Never seen that before either. Looks like a really cute town to visit! Thanks Elli! I never noticed the candles in the window until you mentioned it. 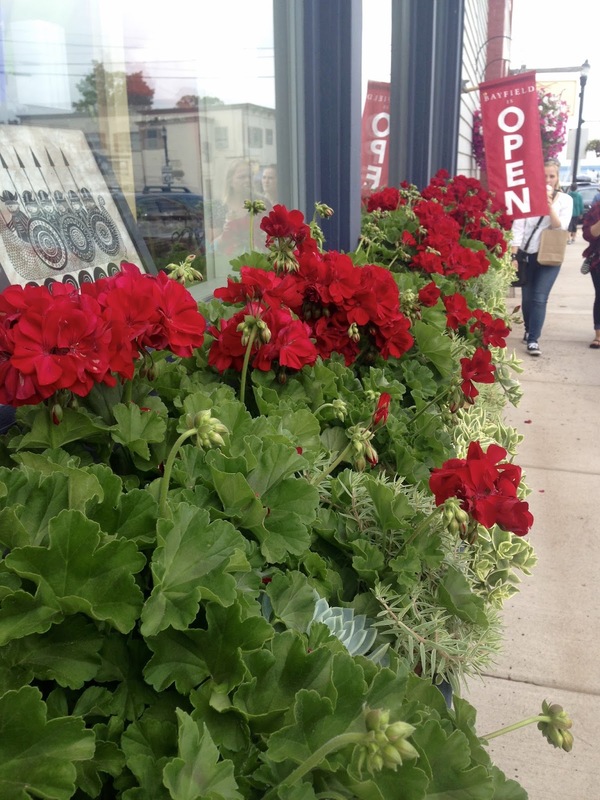 My eye always caught the red geraniums...so funny! 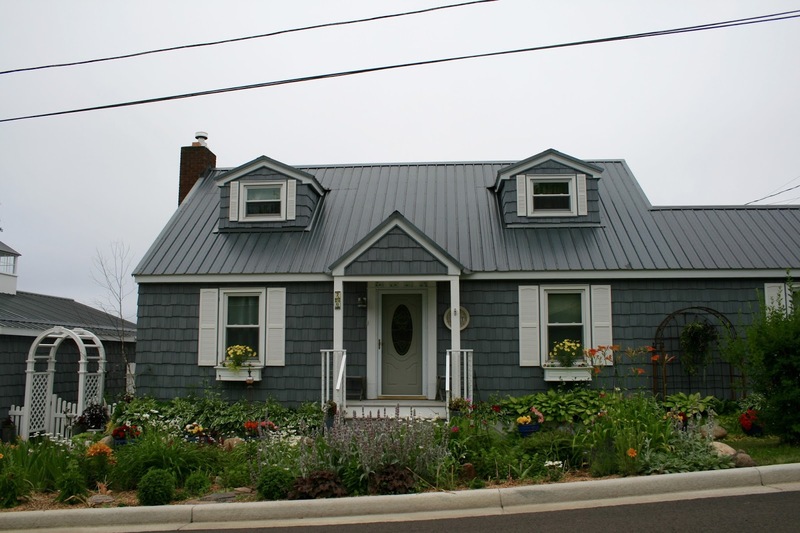 Delightful shots of these great homes and gardens, Amy! You certainly get around, and at least we enjoy the virtual trips through your blog.